I’ve never had much confidence in natural products doing anything for my specific hair condition; much less using essential oils as treatment. So I was initially quite skeptical that this hair tonic formulated with Jojoba oil and 100% pure essential oils including Lemon, Cedarwood, Rosemary as well asÂ True Lavender could do any wonders to control my greasy scalp. But boy was I impressed with how well it kept the oil at bay the entire day for me! 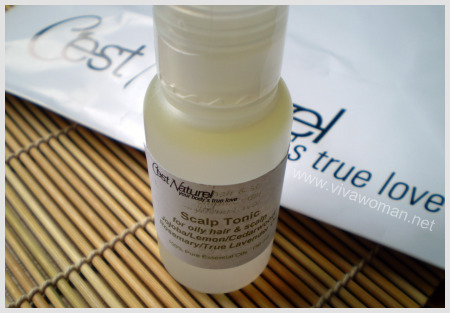 I didn’t even need my dry shampoo when I use this Scalp Tonic for Oily Hair & Scalp from C’est Naturel. This tonic is a customized treatment specific to my hair condition. All I did was described my hair condition to C’est Naturel and they took care of the rest. The online store also has a range of Dead Sea skin and body care range and I’m currently using their Dead Sea Mud and Sea Salt. I quite like the mud but it’s too early to tell of any specific benefits so I’ll run a review sometime later. For now, I’m sold on this Scalp Tonic! What I did was to rub a few drops of the tonic on the crown area of my scalp after shampoo and then blow dry my hair. Although the tonic consists of essential oils, I didn’t feel any oiliness at all. I was half afraid that my hair strands will bunch up together after using this but my worries were unfounded. My hair looked perfectly fine and most important, I could face the day without worry of having to deal with an extremely oily scalp. C’est Naturel is an online shop based in Singapore and on their website, you can find information of the essential oils and their benefits – both for hair and skin.Â If you’re unsure of what oils are suitable for you, always check with them by giving full information of your skin or hair type.Â This way, you can beÂ sure you’re not going to get anything that is unsuitable. My scalp is greasy too and I find that I need to wash my fine hair everyday. It can be a bother especially when you need to go out for something and then look at yourself in the mirror and go “Oowwhh!” Greasy hair It does not help of course that my hair is thinning and parts of my scalp can be embarassingly seen. I will have a look at this website to see if they have anything for me. Thanks for the info! JackieA: This tonic is customized and new so not listed on the website. If you want something similar, you can send them an email to request. prettybeautiful: I hope you’ll get a good respond too! Jac: This is about S$27. You can also have a look at their essential oils with prices listed. The scalp tonic don’t seem to be on the website. Chev: It’s customized for my hair condition and is new. 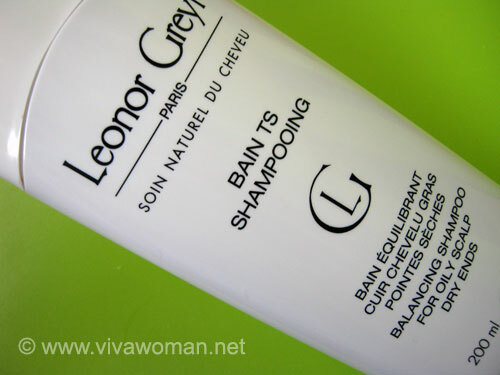 Do you have any recommendations for a good anti-dandruff shampoo? A mid price range will be good. I’m not sure. Last time there was J.F. Lazartigue that had a good product on anti-dandruff. But it doesn’t seem to be available now. hi, I hv hair loss problem recently. Do you think the scalp tonic essential oil works on controlling that? 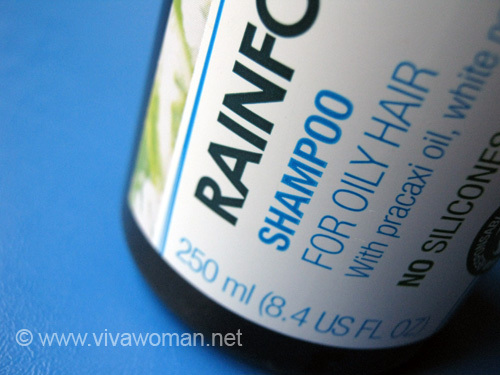 Do you kn of any good shampoo to control hair loss? Shampoo must be used in conjunction with hair tonic to control hair loss. Have you tried the Phyto range or Klorane range? I tried the Phyto range. But it result in more hair loss as well as very dry hair. Now, I’m using the Nioxin as recommended by salon, but also equally bad hair fall. So at a loss now. What’s your recommendation? If we’re talking about counter products, I heard good feedback about Regaine. But I’m not sure if your problem can be resolved as you need to establish the cause of your hairloss. Are you still using this scalp tonic? I’m tempted to get it for myself as they have a stand at Parkway Parade now, but I’m not sure if it is worth the price (they quoted $35). Do you experience any other changes in your scalp, other than reduced oiliness? How long do you estimate one bottle to last? No, I’m not using it anymore. It’s quite a small bottle which only last me like 3 weeks maybe. I find it quite expensive, so decided to stick to using my dry shampoo. During the time I used it, I found my hair less oily but nothing else changed.